The Alabama Center for Ecological Resilience, better known as ACER, was created to better understand the role biological diversity (at the genetic, taxonomic and functional level) plays in determining the resiliency of the northern Gulf of Mexico ecosystem to impact of oiling and dispersants. The habitat focus on the coastal ocean is from ACER's EduBlog. Visit acer.disl.org to learn more. 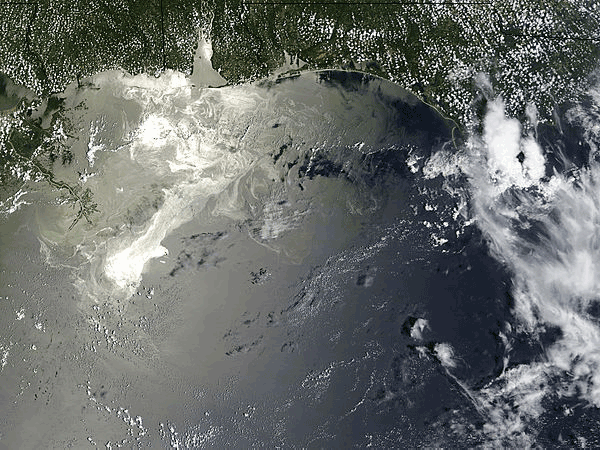 MODIS Satellite image of the northern Gulf of Mexico showing the sediment plume from Mobile Bay and the Mississippi River. Photo credit: Image courtesy Liam Gumley, Space Science and Engineering Center, University of Wisconsin-Madison and the MODIS science team. The sediment plumes visible in the Gulf of Mexico when flying over the northern Gulf of Mexico coastline readily illustrate the influence of our rivers on the ocean. And yet, even when this influence is not visibly apparent, ecological and environmental processes on the coast and upriver in Gulf of Mexico watersheds affect nearshore ocean ecosystems creating a unique habitat known as the coastal ocean. The coastal ocean is that area of the ocean affected by land either directly or indirectly. Traditionally, it is recognized as the area of ocean over the continental shelf and is often referred to as the neritic zone. 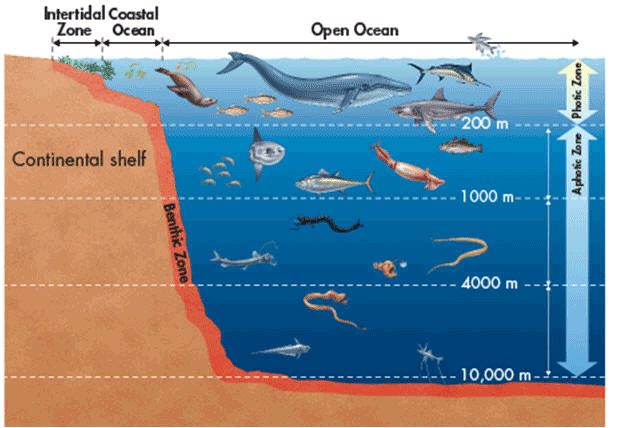 Zones of the ocean. The coastal ocean is the highly productive waters over the continental shelf. Let’s return to our example of sediment-laden river plumes. 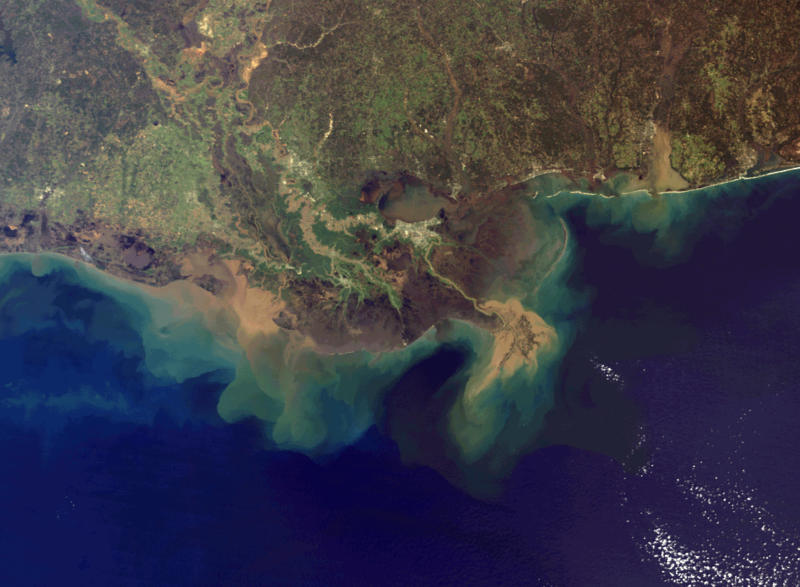 Sediment flowing from the many rivers discharging into the Gulf of Mexico serves as an example of interactions between the land and nearshore ocean processes. As sediment-laden water flows from bays and estuaries to the Gulf, suspended sediment alters the quantity (amount) and quality (wavelength) of light penetrating the water. Light, as we know, is critical for photosynthesis. Higher levels of light in nearshore surface waters will permit more photosynthesis by phytoplankton increasing primary production and increasing the size of the base of the food web. Conversely, lower levels of light result in less primary production (all else being equal). 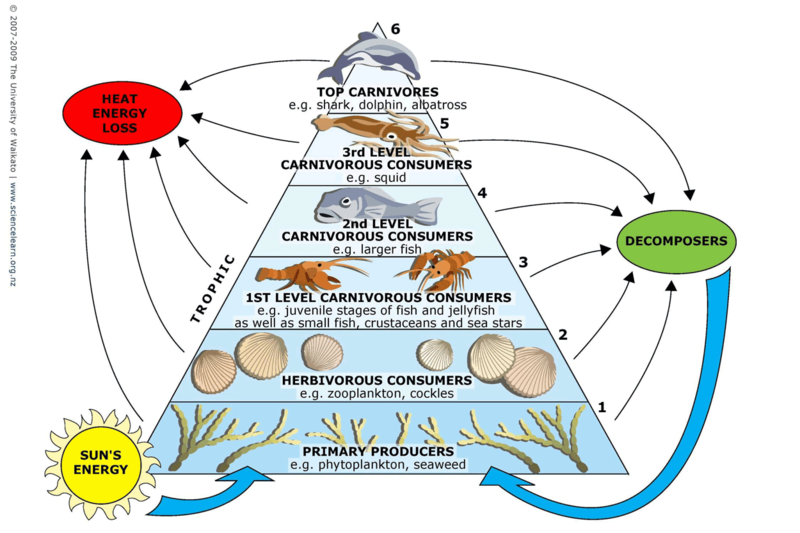 General marine trophic pyramid, where organisms are grouped by the role they play in the food web. Primary producers, e.g. phytoplankton, form the base of the food web and can be heavily impacted by human activities. While the sediment makes this river flow or plumes readily visible, it is important to realize that riverine input to the Gulf occurs continually with or without visible sediment. Consider salinity for example. Rivers bring freshwater to the estuary and though this freshwater is diluted with salt water in the estuary, this flow continues to the coastal ocean impacting salinity (density) driven mixing of coastal waters. Rivers also bring nutrients including various forms of nitrogen and phosphorus. Though nutrients are transformed within estuaries, levels of nutrients in coastal waters are significantly greater than that in the open ocean. These nutrients fuel coastal ocean food webs, but may also have deleterious effects such as fueling harmful algal blooms. Using a more biological example, there are many species of animals such as blue crabs in our area or salmon in more northern areas that move between estuarine (inshore) and coastal ocean (offshore) environments as part of their life cycle. Thus, generally speaking, the coastal ocean is a more productive ecosystem than areas farther offshore, removed from the influence of land. Lastly, as the recent publication led by Dr. Brian Dzwonkowski and discussed in a recent ACER news post pointed out, the coastal ocean area is affected by estuarine water exchange even when river flow is low. Scientists have recognized the uniqueness of the coastal ocean for a number of decades. Large interdisciplinary research programs have focused on this ecosystem studying ecological and hydrological processes (e.g. NSF’s Land-margin ecosystem research program – LMER; NOAA’s Coastal Ocean Program – Gulf of Mexico, NECOP). More recently, research programs have focused on human impacts on these unique coastal ocean areas including NOAA’s ECOHAB program (Ecology and Oceanography of Harmful Algal Blooms) that focuses on harmful algal blooms or NOAA’s CHRP (Coastal Hypoxia Research Program)https://coastalscience.noaa.gov/research/stressor-impacts-mitigation/habhrca/chrp/ that focuses on hypoxia. And now, with the Deepwater Horizon oil spill, the Gulf of Mexico Research Initiative (GoMRI) is a multi-million dollar research program designed to assess the impacts of oil, dispersed oil, and dispersants on the ecosystems of the northern Gulf of Mexico. ACER, one of the research groups within this broader research program and headquartered at the Dauphin Island Sea Lab, is focusing on this coastal ocean.